Here's a few ideas for delicious sandwiches that are lower in fat and or calories, or just different enough to be new and interesting. There are so many types of breads, tortillas, and rolls but for a different twist make an inside out sandwich by putting the meats, cheeses, and garnishments inside a hearty piece of lettuce which you can wrap. Drop your beloved mayo and replace it with a thin slice or smear of avocado. Yes avocados are high in fat but it's the good fat that helps rid your body of the bad fats Also using about a fifth of one isn't too high in fat or calories. Many people like pickles, I know I do, but the amount of sodium is really bad for me and many other people too. May I suggest replacing the pickle with a crisp slice of cucumber or a fresh Kirby ( a small cucumber pickle before it's pickled) and a few sprigs of fresh or even dried dill. When you use dried herbs remember to crush them between your fingers first to release their full flavor. If you love sloppy hamburgers this article is for you. 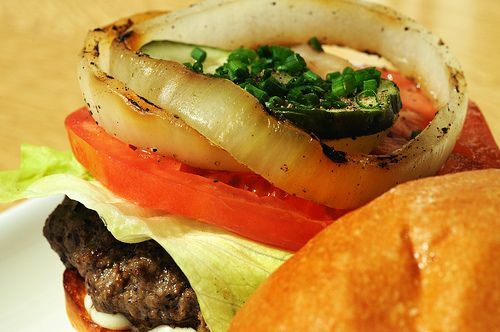 The burger is bursting with sauce and great flavors. Here's how I put it together. The hamburger patty itself is just a large very thin piece that is simply seasoned with salt, pepper, and a little garlic powder. Then I made my famous caramelized onions with my favorite, Vidalia. I chop the onion or just cut it into rings, add a little extra virgin olive oil, a healthy amount of sugar, brown if you have it, but regular sugar does just fine, and a good dash of balsamic vinegar to give it that kick with an extra layer of mouth watering flavor. To put this sandwich together I took the bun and on one side put my olive oil mayo and the other side Sweet Baby Ray's barbecue sauce. Then the burger, with sliced tomato, crisp lettuce, raw onion rings, and topped with the caramelized onions. A friend who tried it took his first bite and said " wow, the flavors ", then after finishing it he said it was the best tasting burger he' s ever had! Of course you can add cheese, I just didn't happen to have any when I made these, but you can experiment with different cheeses and you can always add more interest to the meat if you choose. Enjoy! Got leftover turkey? 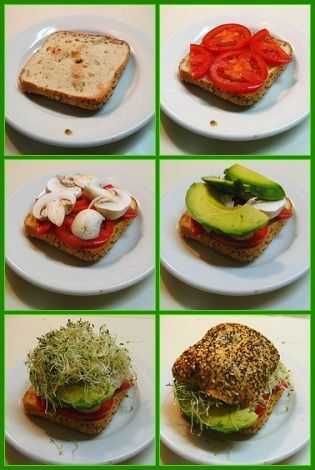 Make sure you use it to make some of these wonderful sandwiches. OK, you know what to do. Spread mayo on bread, add turkey, cranberry sauce, and the stuffing. If you like a crunchier sandwich use the creamy coleslaw or any mayo based salad, such as the remains of a 7-layer salad. 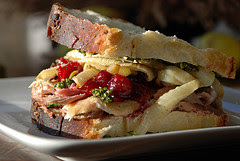 This sandwich is just what you need after the holiday is over!